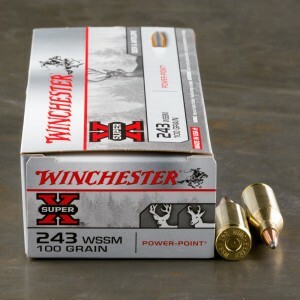 243 WSSM ammunition is also known as the 243 Winchester Super Short Magnum and was designed in 2003 by Winchester Repeating arms. The original 243 Winchester ammunition cartridges were extremely popular since their introduction, so forming a Super Short Magnum designation was an easy prediction. The 243 WSSM features the same 6.2 mm bullet on top of the standard short case that had been fattened extensively to allow for a higher case capacity. This makes the 243 WSSM essentially a short, fat, and powerful round. The advantages of increasing width for case capacity over increasing length is the ability to use a shorter bolt action. This allows for ease of manipulation and faster follow up shots. 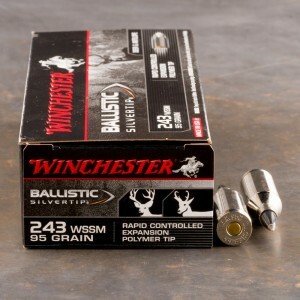 243 WSSM ammo also has the advantage of working in AR 15 semi automatic rifles. Although these rifles are not common, the short case allows the user to utilize the AR 15 over the AR 10. The 243 WSSM is plenty powerful for deer and medium game, but is also useful for smaller game like varmint and predator. A lighter projectile, like 58 grain projectile can reach over 4,000 feet per second, and heavier 100 grain projectiles can stay over 3,000 feet per second. I have not shot any of the rounds I just purchased but have shot this brand and type in the past. Excellent round for long distance accuracy with effective knock down power even at long distance.